NJCCVTS Executive Director Judy Savage is joined by Senate President Steve Sweeney (center), representatives from NJBIA, business groups and other supporters of the Securing Our Children’s Future Bond Act, including students from Mercer County Technical Schools. 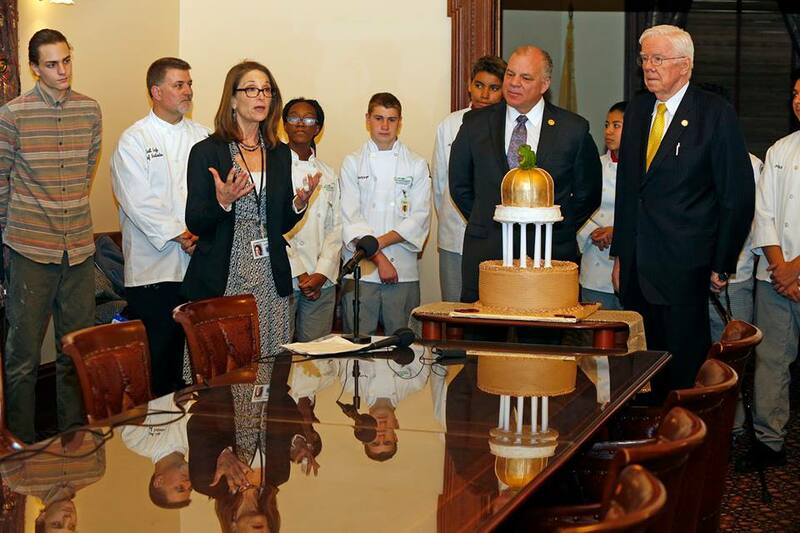 The NJ Council of County Vocational Technical Schools hosted a Statehouse event on Monday to thank lawmakers, NJBIA, and other supporters who worked toward the successful passage of the Securing Our Children’s Future Bond Act on Election Day to help close the “skills gap” in New Jersey. The $500 million bond act approved by voters on Nov. 8 includes $350 million for much-needed expansion of career and technical shops, labs and classrooms at county vocational-technical schools, as well for enhanced security at New Jersey schools. Another $50 million goes toward career and technical education projects at county colleges. In an op-ed published in the state’s largest newspaper before voters went to the polls, NJBIA President & CEO Michele Siekerka made a persuasive case for the bond act, noting that the state’s manufacturers report having more than 30,000 unfilled technical jobs available, but not enough qualified applicants for these positions. In order to grow the state’s economy, New Jersey needs skilled technical workers for these vacant jobs, Siekerka said. At Monday’s news conference, NJCCVTS Executive Director Judy Savage thanked Senate President Steve Sweeney, the sponsor of the bond act, NJBIA, and a host of other supporters including: the New Jersey Chamber of Commerce, NJMEP, New Jersey Builders Association, New Jersey Utilities Association Inc., NJ Restaurant & Hospitality Association, New Jersey Association of Counties, and New Jersey’s Community Colleges. Students from the Mercer County Vocational Technical Schools created the cake used for the celebration.